Apple cider vinegar provides benefits that may reduce or prevent acid reflux. Although apple cider vinegar contains acetic acid that can trigger reflux for some people, others use apple cider as a remedy for heartburn, the pain and burning in the upper chest and throat from acid reflux. The effectiveness of a treatment may depend on the person and the cause of heartburn. Just as acid reflux triggers differ among people, solutions may also affect people differently. Acid reflux occurs usually after consuming certain foods and beverages or eating heavy meals. When it does not contract properly, a weakened esophageal muscle allows stomach acid backup, according to the National Digestive Diseases Information Clearinghouse. The ring-like muscle opens as food and drink enter the stomach, and then closes. Foods that relax the muscle and trigger acid reflux may include high-fat foods, fried foods, tomato-based products, onions, garlic, caffeine and carbonated beverages, but you may have your own specific triggers. Large meals increase the risk of acid reflux by delaying digestion and causing the stomach to secrete more acid. Your stomach may not have enough acid or you may eat foods low in acidity, resulting in acid reflux. Apple cider vinegar mimics the acid level of your stomach to help digest foods properly, according to Disabled-World.com. Taking 1 tablespoon apple cider vinegar before each meal may reduce symptoms, and continuing the practice for three to nine months may eliminate acid reflux. Organic apple cider vinegar may retain more of the natural enzymes. Like many home or folk remedies, apple cider vinegar may provide relief from acid reflux for some people, but not for others. Just as you have particular foods that affect you, the remedies may also differ. People who say apple cider vinegar works for heartburn relief mix anywhere from 1 teaspoon to 2 tablespoons in a glass of water before drinking. Others swallow 1 teaspoon apple cider vinegar, which may cause a burning sensation for a moment before quick relief from heartburn. 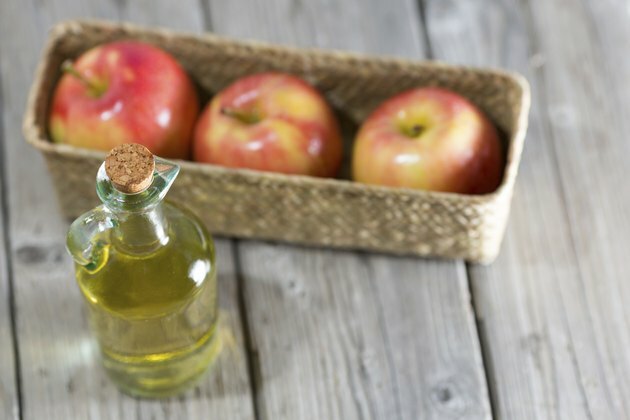 You may want to experiment carefully with apple cider vinegar if you don’t have antacids or other methods available. Since these home remedies have not been clinically proven, see your doctor for dietary and medical advice if you have frequent acid reflux. Apples contain the same enzymes as apple cider vinegar, which comes from crushed and fermented apples. Many acid reflux diets include apples as a recommended food. Apple cider vinegar may provide intestinal protection to prevent acid reflux. The vinegar lowers the blood’s pH levels to help the intestinal system fight harmful bacteria and fungi. Apple cider vinegar may also have some antimicrobial properties, according to the University of Maryland Medical Center, which recommends taking 2 teaspoons in a cup of warm water several times a day for food poisoning. The antimicrobial action from apple cider vinegar could help avoid intestinal problems that lead to acid reflux.